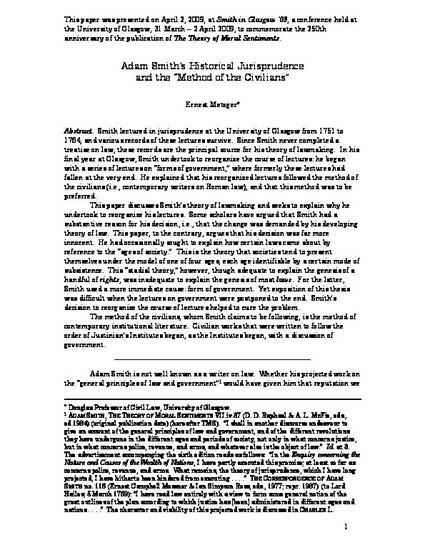 Adam Smith's Historical Jurisprudence and the "Method of the Civilians"
Smith lectured in jurisprudence at the University of Glasgow from 1751 to 1764, and various records of these lectures survive. Since Smith never completed a treatise on law, these records are the principal source for his theory of lawmaking. In his final year at Glasgow, Smith undertook to reorganize the course of lectures: he began with a series of lectures on "forms of government," where formerly these lectures had fallen at the very end. He explained that his reorganized lectures followed the method of the civilians (i.e., contemporary writers on Roman law), and that this method was to be preferred. This paper discusses Smith's theory of lawmaking and seeks to explain why he undertook to reorganize his lectures. Some scholars have argued that Smith had a substantive reason for his decision, i.e., that the change was demanded by his developing theory of law. This paper, to the contrary, argues that his decision was far more innocent. He had occasionally sought to explain how certain laws came about by reference to the "ages of society." This is the theory that societies tend to present themselves under the model of one of four ages, each age identifiable by a certain mode of subsistence. This "stadial theory," however, though adequate to explain the genesis of a handful of rights, was inadequate to explain the genesis of most laws. For the latter, Smith used a more immediate cause: form of government. Yet exposition of this thesis was difficult when the lectures on government were postponed to the end. Smith’s decision to reorganize the course of lectures helped to cure the problem. The method of the civilians, whom Smith claims to be following, is the method of contemporary institutional literature. Civilian works that were written to follow the order of Justinian’s Institutes began, as the Institutes began, with a discussion of government. The final version of this paper was published at: Loyola Law Review, vol. 56, 2010, pp. 1-13."